Beyond the Glass Adventure Tours offers Hiking and Cycling tours on Ireland's Wild Atlantic Way. Hike along splendid Irish coast lines, above crystal blue waters and beneath ruggedly beautiful mountains. Cycle along quiet country roads on Ireland's Western Coast line and feel the freedom of Ireland's Wild Atlantic Way. Walk where life first walked on Earth 385 million years ago, visit 2000 year old Neolithic sites, ancient tombs and world famous castles. On each day of our multi-day tours you will enjoy the best of outdoor adventure in stunning locations. We offer hiking holidays and mixed adventure hiking and cycling holidays. 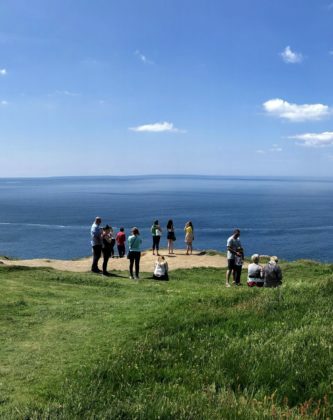 When you join our tours we will also show you the best of Ireland's Wild Atlantic Way including Blarney Castle, Dingle, the Cliffs of Moher and the Aran Islands. We have selected excellent 3 star and 4 star accommodation where you can relax and unwind at the end of each rewarding days adventure. Beyond the Glass Adventure holidays are suitable for active people, our tours require a reasonable level of fitness. If you are in the process of planning your 2019 Adventure, then check out our tours page or contact us at info@beyondtheglass.ie. BEYOND THE GLASS ADVENTURE TOURS offers multi-day guided activity holidays on Ireland's WILD ATLANTIC WAY. We specialise in hiking and cycling tours for small groups. 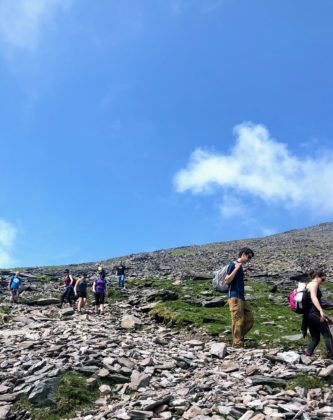 We will take you off the beaten track to see hidden Ireland and to experience outdoor adventure, culture and historical sights all while being immersed in Ireland’s stunning natural landscape. We offer hiking holidays and mixed activity hiking and cycling holidays. With Beyond the Glass Adventure Tours you will have the ultimate adventure travel experience. Check out our 8 Day Explorer Tour, our 6 Day Adventurer Tour and our 5 Day Hiker Tour. The Wild Atlantic Way is the longest defined coastal touring route in the world. It stretches for over 2,500km along Ireland’s spectacular western seaboard. 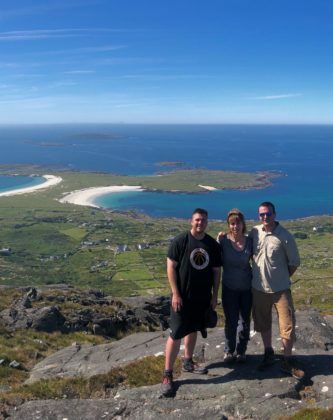 We at BEYOND THE GLASS ADVENTURE TOURS have selected some of the very best parts of the Wild Atlantic Way for our hiking and cycling adventures tours so you will have the most enjoyable adventure holiday in Ireland 2019. All Beyond the Glass Adventure tours leave from Cork City. The Cork City Cycle Tour takes approximately 3 hours. 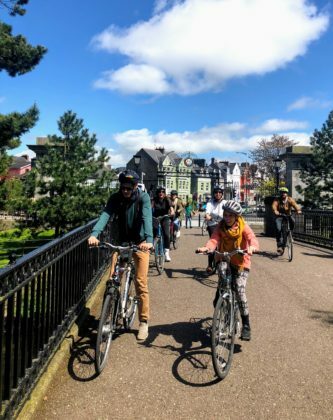 During the cycle tour you will sample Corks rich history, stretching back over 1,500 years, we show you the best parts of Cork City, some of its beautiful parks and a few of Cork’s hidden secrets. To book your place visit the Cork city cycle tour page. I had the pleasure to spend a lovely multi-day tour thanks to Beyond the Glass Adventure Tours. I had the chance to visit some astonishing places in an amazing part of the west of Ireland. I shared this experience with a fun company and a friendly guide, James. Biking and hiking, we saw stunning landscapes, such as Inis Mor and the Erisberg Mountain, not to mention the ocean. We also had the opportunity to learn something about the Irish history, especially about the Famine, visiting also the National Famine Memorial. Moreover, we slept some nice B&B, very comfy and tidy. It was one of the best tours here in Ireland until now and I highly recommend it. if you want to live an experience in contact with nature, breathing the spirit of true Ireland, this is the best way!! James is a fantastic guide and the tour was amazing. We took the 8 day tour of the Wild Atlantic Way on the West side of the island. James was brilliant (as they say in Ireland) and had an answer to nearly every question (of which there were many). His knowledge of Ireland is quite impressive and he was able to show us cool hidden gem locations with some insane views because of his personal history of biking, hiking, and travelling the country. I don’t think we would have gotten the same experience with a larger company, as James’s familiarity with the lesser known areas allowed us to explore areas tourists typically don’t see. He mixes up the activities so you cant get bored and so you get the most out of your time on vacation. You can always tell when someone is passionate about what they do and James has passion in spades. I would highly recommend his tours for anyone looking for an authentic Irish experience. Mary: Definitely, the tour Agency Beyond The Glass Adventure Tours is the best option to do adventure tourism around Ireland. We had unforgettable days in the company of friendly people who know the region and offer safety and moments of pleasure during the journey. Thank you so much for everything, you are the best. We hope see you soon. Marcus: This was the best trip I’ve done in Ireland. Our trip was in west of Ireland, we cycled, walked and climbed mountains with beautiful landscapes. We also learned more about the history of Ireland. Everything was perfect, sightseeing, accommodations, restaurants, time we stayed at each place. Our guide was James, he is fantastic. If you are looking for a trip with adventure, contact with nature and gorgeous scenery, this is the best agency. I had the pleasure of meeting James in 2013 while hiking through several feet of unexpected snow in central Virginia along the Appalachian Trail. He’s got a wonderful sense of humor and an unwavering admiration for the outdoors. I’m thrilled that he has pursued his love for the outdoors and is sharing that enthusiasm with others in the best of ways. For those who are looking to book an adventure tour, I can assure that you are looking in the right spot. You couldn’t ask for a better guide, and the memories will last you a lifetime.